Serving businesses and the community: The Chamber of Commerce, with a membership of some 500 leading businesses and citizens, serves primarily as the voice and unmatched marketing, promotional and resource center for the Arcadia business community. 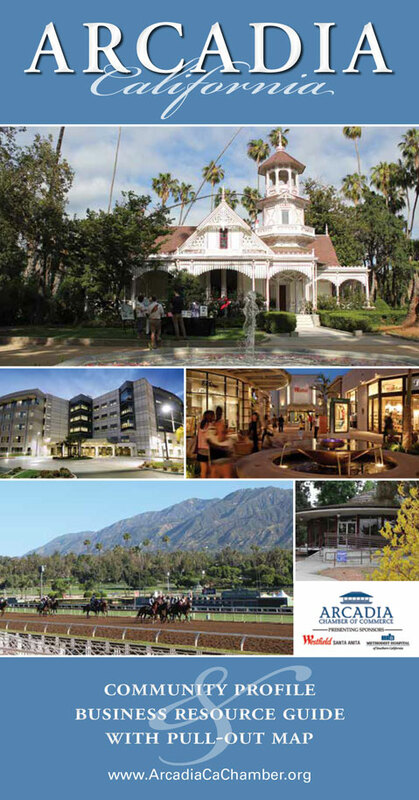 The Chamber sponsors a variety of events, including monthly networking breakfasts and luncheons, a Community Connection forum, and two of the City’s biggest events of the year: Taste of Arcadia, held at the L.A. County Arboretum each September; and the Citizen of the Year & Board installation dinner each spring. The Chamber also hosts the State of the City and supports the community and local non-profit groups in a number of other ways. Our roots in the community: The Chamber celebrated its 90th anniversary in 2011, and threw a big bash in July 2009 to mark the 75th anniversary of the Chamber’s official incorporation, with the dedication of a historical marker and a visit by former Arcadian and TV game show host Wink Martindale. In 1965, the Arcadia Chamber of Commerce became the geographic hub, as well as the civic hub of the City, when it moved into its eye-catching circular office at the west end of the Civic Center island where Holly Avenue meets Huntington Drive, across from the famous Santa Anita Race Track. Office hours: 9 a.m.-5 p.m. Monday–Friday excepts holidays. Contact the Chamber. Get directions. Donations: Various contributions are made throughout the year, such as 25% of all sales of Christmas trees donated to the Arcadia Rotary Club in 2014. Special projects: Special Olympics Host Town 2015 – organized high-profile media kick-off announcement with Mayor and 75 community leaders, covered by TV and newspapers; arranged three night stays and breakfasts for 100 athletes and mentors at Chamber member hotels. Recognition: Tributes to groups, such as Arcadia Assistance League. Support: Buy ads, present certificates and awards, promote and attend fundraisers and celebrations of local groups, such as The Woman’s Club, the Arcadia Chinese Association, Methodist Hospital, and Boys & Girls Club of the Foothills (such as Yuletide and Wreath sponsor 2014 Festival of Trees). Community Calendar: Post community group events on Chamber web site calendar. Volunteer: Many Chamber staff and members volunteer at community events, such as The Breeders’ Cup. Boardroom rentals: Dozens of local groups book the Chamber conference room more than 150 times each year for meetings at very low rental fees. Taste of Arcadia: Called Arcadia’s signature event, the program attracts more than 1,500 attendees for a fun evening of great food and entertainment while highlighting the LA County Arboretum. Citizen of the Year / Installation Dinner – Special annual spotlight on the finest and most giving individuals and companies in the City of Arcadia. Information: Assist walk-in visitors and callers with directions, city information, maps, etc. Tourists: Provide thousands of tourist & visitor information brochures.